Is your writing missing a certain je ne sais quoi? $2,450 for private room, $2100 each for friends or couple sharing a room. Includes writing consultations and daily writing workshops, a visit to a farmers' market and tastings at local wineries, all meals, wine and after-dinner drinks. Why write at home when you can write in a castle? There are so many writing workshops and retreats, but there’s only one Writeaways. And that’s because there’s only one John and Mimi. And only one Chateau du Pin. The combination of place and people compels participants to write and improve – and to enjoy each moment. 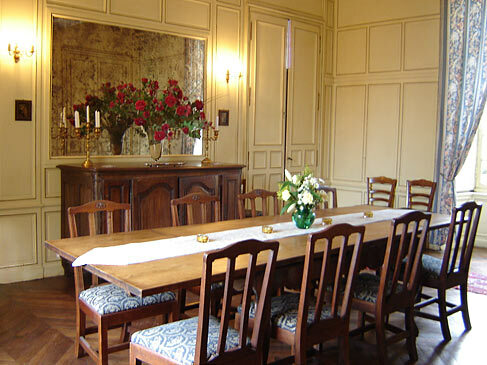 BREAKFAST – Begin your day in an elegant fifteenth century French chateau, as you dine on fresh croissants, cereal, yogurt, coffee, teas and juice. WRITING CLASSES – Join Mimi Herman and John Yewell for in-depth workshops on the craft of writing, suitable for all levels. Their exercises will inspire you to discover new imagery, metaphor and memories. Whether you're a poet, fiction writer or memoirist, John and Mimi will rejuvenate your writing. LUNCH – Mingle with other writers over lunch, served in the chateau dining room or al fresco on the grounds. Lunches are a changing medley of soups, sandwiches, quiches, fruits, cheeses and cookies. FREE TIME & EXCURSIONS - Write, conference with Mimi or John, and explore the chateau’s secret tower rooms, lily ponds and gardens. An afternoon of tastings at local wineries is included in your stay. Delightful side trips in the surrounding countryside are available, as a group or on your own. DINNER - Share a four-course meal prepared by our own French chef, Anne Villeday. Dinners are served family-style, with plenty of wine to go around. Each evening's meal includes an entrée, a main course, fresh French bread, a cheese course featuring local cheeses, and a delightful dessert. EVENINGS - After dinner, relax with a reading of the day's work with your fellow writers, or take an evening stroll of the grounds before retiring upstairs to your charming bedroom. BEDROOMS - Bed sizes range from single to king. Some bedrooms offer three beds, if you'd like to invite more than one friend to join you in France. Chateau du Pin is tucked inside a 300-acre estate in the sleepy French countryside, outside the village of Champtocé-sur-Loire, a half-hour car ride from the city of Angers in the province of Anjou. Angers is a leisurely three to four hours from Paris by car or 1½ hours by high-speed train.